Please say bonjour to La Mom's guest blogger Richard Nahem of Eye Prefer Paris (www.eyepreferparis.com). 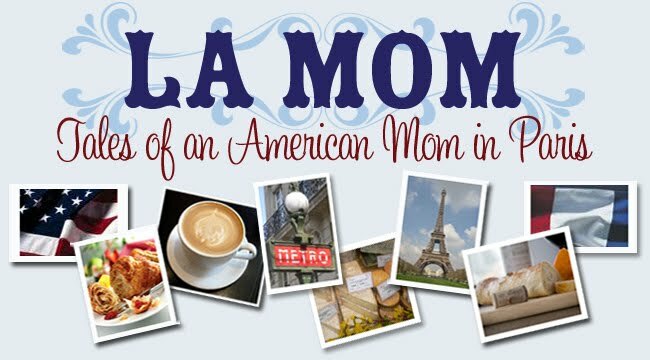 Check out la La Mom's guest post over at Eye Prefer Paris today. When he's not photographing the best of Paris, Richard leads the popular Eye Prefer Paris walking tours. He's certainly got an eye for style as well. Here's his advice for dressing to impress in the City of Light. 1. Big white athletic sneakers. Save these white elephant clunkers for jogging at home. If you need to wear sneakers (I wear them all the time), buy some cool colored Pumas or Converse All Stars. 2. Visors or baseball caps with baseball team logos. Save them for local stadium. 3. Football or basketball jerseys, baseball team shirts, or anything else that signifies you love American sports. You may pass as French in a soccer shirt, but not as a chic Parisian. 4. Running or athletic shorts, ESPECIALLY the thin nylon ones with the side slits/vents. They look atrocious enough at home, so don’t wear them here. 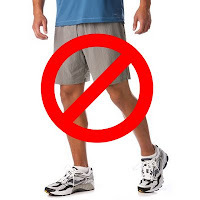 If it’s over 90 degrees and you must wear shorts, wear khaki or walking shorts. You will still look like a tourist but you won’t offend anyone. 5. Rubber flip flops. Good for the shower but not on the boulevards of Paris. And for god sakes, DON’T EVER wear shorts AND flip flops. 6. Fanny Packs. I don’t have to explain this one, do I? Possible exception: a Prada, Vuitton, or Gucci one. You may look like an Italian tourist wearing one of those but that’s a lot chicer than looking like an American tourist. 7. Dockers, generic khaki pants, and baggy, ill fitting jeans. We know they are comfortable, but if you want to look Parisian you have to suffer for fashion a wee bit. 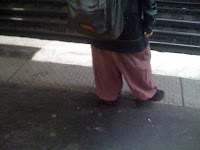 One Paris fashion trend you should not take back home with you: balloon/harem pants. This look is big with young girls here for some bizarre reason. Even the prettiest, thinnest girls look simply hideous in them. So don’t be tempted to get off the plane when your return home wearing a pair and claiming you are following the latest fashion craze in Paris. (Crazy is more like it). Your friends and relatives will be so turned off to Paris from them that they won’t ever want to visit and this would make a big dent in my Eye Prefer Paris Tour business. Read La Mom's guest post on Eye Prefer Paris (www.eyepreferparis.com) today to work the chic Parisianista look.